Take a short drive from the bright lights and smoke-filled casinos and enjoy some of Southern Nevada's wonders. These day trips remove you from what the strip is famous for and introduce you to another side of Las Vegas. Below you'll find reasonable day trips from Las Vegas. Some include road trips best done with an overnight stay at one of the locations. Book a cheap hotel and jump in the rental car and you'll explore a part of the United States that is vast and scenic. You'll return to the Las Vegas strip and realize that you combined two trips into one. The Grand Canyon in western Arizona lies approximately 300 miles (480 kilometers) - a one-hour flight from Las Vegas. Over millions of years, the Colorado River carved this natural wonder that is one mile deep and 277 miles long. Sightseeing air tours of the Grand Canyon depart Las Vegas daily for half-day, full-day, and overnight excursions. You can also drive there in a few hours, but a return trip on the same day might be a bit taxing. Hoover Dam is an engineering wonder of the world just 35 miles (56 kilometers) southeast of Las Vegas. Formerly named Boulder Dam, this historic man-made creation tamed the mighty Colorado River and created North America's largest man-made lake, Lake Mead. This is an easy day trip that allows you to extend it a little into the desert or combine it with a different location. Death Valley is located in western California, 135 miles (216 kilometers) from Las Vegas and a mere 40-minute plane ride away. This scenic wonder has the lowest elevation on the North American continent at 280 feet (84.93 meters) below sea level. Points of interest include Zabriskie Point, 20 Mule Team Canyon, and Scotty's Castle. In the summer months, the heat is oppressive and conditions verify the moniker of Death Valley. However, if you are just a couple of hours away from this natural wonder you really need to see it. 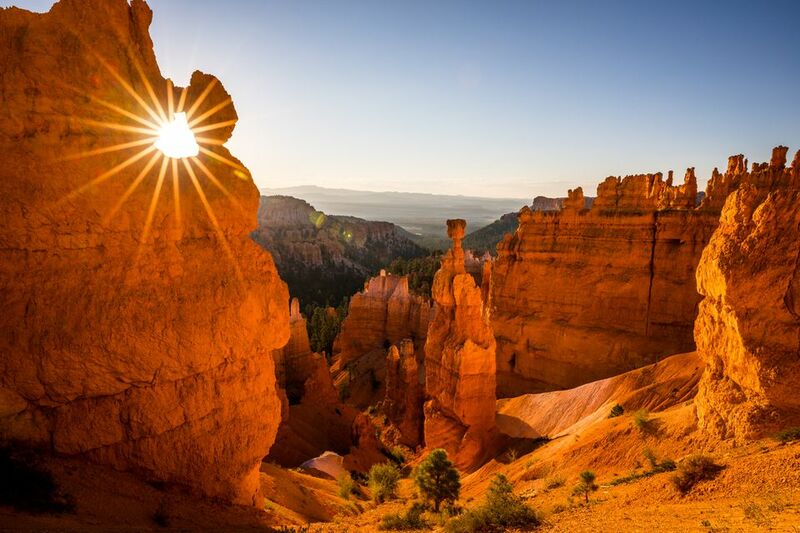 Bryce Canyon is located 210 miles (336 kilometers) northeast of Las Vegas in southwestern Utah. The national park is home to some unique rock formations with imaginative names like Pink Cliffs, Silent City, and Cathedral. You can watch the sun move across the formations and capture a natural light display that will stick with you forever. Find a campground and stay overnight or do the quick drive through Zion National Park for one of the most scenic drives you can ever imagine. Red Rock Canyon is just 15 miles (24 kilometers) west of Las Vegas. It is a scenic area of rock formations and desert with a 3,000-foot (910-meter) escarpment produced by a thrust fault. Open to the public year-round, Red Rock Canyon has a Bureau of Land Management visitors center and is home to feral horses, wild burros, bighorn sheep, coyotes, and a variety of desert plant life. If you like the adventure sports of rock climbing and mountain biking you can be sure to get your fill here. Bonnie Springs Ranch/Old Nevada lies about 20 miles (32 kilometers) west of Las Vegas near Red Rock Canyon. Bonnie Springs Ranch was built in the 1840s as a cattle ranch and watering hole. Adjacent to the ranch is Old Nevada, a place where tourists can witness a re-creation of an Old West town complete with gunfights, horseback riding, children's petting zoo, and mini-train rides. Bonnie Springs Ranch/Old Nevada is open to the public year-round. Valley of Fire State Park is only 55 miles (88 kilometers) northwest of Las Vegas and comprises scenic landscapes, hidden canyons, and unique red rock formations. Petroglyph's and remains of ancient Native American civilizations can be viewed here and a Nevada Park Service visitors center provides tourist information. The park is open to the public year-round and tours are available. Mt. Charleston is 35 miles (56 kilometers) from Las Vegas with its highest elevation at 11,918 feet (3,615 meters). An average of 20 to 30 degrees cooler than Las Vegas, Mt. Charleston is perfect for skiing, picnicking, hiking, and horseback riding. In addition to year-round hotel accommodations and tours, full-service camping is also available from May through September. If you just want to get a look at what the rest of Southern Nevada is like this gives you a good idea that it is not just about gambling and late night action. Mojave National Preserve is only 60 miles (97 kilometers) southwest of Las Vegas. This 1.6-million-acre preserve, which protects one of the most diverse environments in the world, abounds with sand dunes, volcanic cinder cones, Joshua tree forests, and mile-high mountains. Two visitors centers introduce you to the desert environment, however, while it is engrossing for the desert rats you might find that the lack of organized structure difficult to navigate. Rhyolite is a well-preserved ghost town 120 miles (193 kilometers) north of Las Vegas near the small community of Beatty, Nev., which bills itself as the "Gateway to Death Valley." Highlights of the area include ruins of the Potter General Store, Newton's Grille, a school, several major banks, a house made entirely out of bottles and a railroad depot. Boulder City is just 30 miles (48 kilometers) east of the Las Vegas Strip, on the way to Lake Mead. Built in the '30s for Hoover Dam construction workers' families, it is the site of the historic Boulder Dam Hotel, and the only Nevada city that does not allow public gaming. Boulder City's historic Old Town district is home to many quaint shops, several of which feature works by Native American jewelers. Lake Mead National Recreational Area is just 25 miles (40 kilometers) from Las Vegas at its closest point. With more than 550 miles (880 kilometers) of shoreline, Lake Mead Recreational Area offers outdoor enthusiasts year-round opportunities for swimming, water skiing, camping, boating, fishing, tours, and cruises. A popular activity is renting a houseboat and floating around for a few days.